• Basic stimulation frequency up to 180 ppm. • Rapid atrial pacing up to 720 ppm. • Large ergonomically designed rotating dials all parameter settings. • Protective cover to safeguard against accidental changes to the device settings. • Long battery lifetime: up to 38 days of operation with a single 9V alkaline battery. • Sensed intrinsic activity and paced pulses are indicated optically by a LED. • Automatic surveillance of battery charge condition. • Pacing run-away protection feature. single-chamber cardiac pacemaker has the reputation of a legendary workhorse - easy to operate, very durable and light weight. 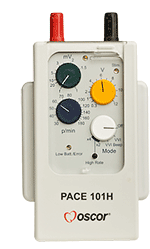 It is intended for temporary atrial or ventricular pacing and supports synchronous (VVI, AAI) and asynchronous (V00, A00) operating modes.